We mentioned this yesterday as it happened, but Treasuries traded down to previously unseen yields. The 3 month T-bill went negative yield for the first time ever. At auction, Treasury sold $27 billion of three-month bills at a discount rate of 0.005%. This is the lowest yield since it starting auctioning the securities in 1929. Just as astounding, the U.S. sold $30 billion of four-week T-bills, at zero percent for the first time ever (4 week treasuries have been around only since 2001). Today’s WTF article is this clever funding idea, via former Treasury undersecretary (now at BlackRock) Peter Fisher: Issue 100-year bonds. Has the Market Fully Discounted the Bush Presidency ? What is it that the market is pricing in? While partisans try to blame the crash on one or the other candidates, here's something I have yet to hear any of the TV pundits discuss: The George W. Bush presidency. While partisans try to blame the crash on one or the other candidates, here's something I have yet to hear any of the TV pundits discuss: Blaming it on the presidency of George W. Bush. Equities: Which Sell off do you hold the occupant of the White House Responsible for: The One that began prior to his arrival, or the one that began prior to his departure? I do not believe that the 2000-03 crash was a result the markets pricing in a Bush Presidency. However, one could certainly make the case that the past few years market action has been the result of his fiscal, tax, and spending policies. The Gold market is a store of value in uncertain times -- what is it saying about the Bush policies? What are the markets really pricing in ? Might it be the W. presidency? In its statement, the Federal Open Market Committee suggested that recent policy actions should help over time to improve credit conditions. Financial markets have evidenced some very modest improvement in credit spreads, but the search for that new equilibrium between risk and reward remains in progress. For example, both the price and the availability of credit to the high grade and high yield bond markets have assumed a very different tone from earlier in this decade. 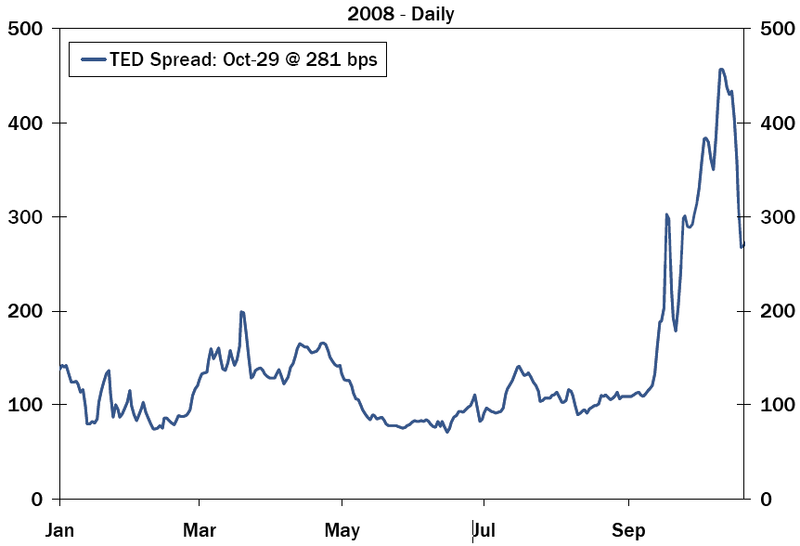 Meanwhile, the TED spread widened to over 400 basis points and has now retreated below 300 basis points (Figure 3). Commercial paper issuance has increased especially for commercial paper maturities over 81 days. The market and the economy remain constrained by the paradox of lemons—make more lemonade. This process will take time and supports continued Fed easing at the short end of the curve and credit aversion in the private market. "Federal Reserve Chairman Ben S. Bernanke signaled he's ready to cut interest rates to the lowest level on record should the central bank's actions fail to stem the deepening economic slump. In a new step to increase the availability of dollars in emerging markets, the Fed yesterday agreed to provide $120 billion to four counterparts. Brazil, Mexico, South Korea and Singapore get $30 billion each by signing the so-called currency swap lines. The U.S. already has unlimited agreements with the European Central Bank and Bank of England." Inflation from 2002-07, Deflation from 2008-09, hyper inflation from 2010-??? I could see Gold going to $3,000, by way of $300 first. At 1.5%, rates are historically low. And the problem isn't the cost of credit, its the availability of credit. Rate decision in 5 minutes. Federal Reserve cuts interest rates to 1% -- the lowest levels since 2003. Continue reading "Is Money Too Expensive? " Iceland Central Bank: 18% Rate! Gee, do you think they are trying to attract some capital? Iceland's central bank unexpectedly raised the benchmark interest rate to 18 percent, the highest in at least seven years, after the island reached an aid agreement with the International Monetary Fund. Policy makers raised the key rate by 6 percentage points, the Reykjavik-based bank said in a statement on its Web site today, taking the rate to the highest since the bank began targeting inflation in 2001. It will publish the reasons for today's move at 11 a.m. local time. The central bank is raising rates as Iceland, the first western nation to seek aid from the IMF since the U.K. in 1976, faces a prolonged contraction, coupled with possible hyperinflation and rising joblessness. The economy will shrink as much as 10 percent next year, the IMF forecasts. Iceland will receive about $2.1 billion in aid from the Washington-based fund, according to a deal struck on Oct. 24. The US Fed starts a two day meeting today . . . There is a general lack of understanding as to how the Housing boom and bust occurred, and why it led to the subsequent credit freeze. The situation is complex, and that is why we are still explaining this 3 years into the housing bust. Underlying EVERYTHING -- housing boom and bust, derivative explosion, credit crisis -- is the enormous change in lending standards. I am not sure many people understand the massive change that took place during the 2002-07 period. It was more than a subtle shift -- it was an abdication of the traditional lending standards that had existed for decades, if not centuries. After the Greenspan Fed took rates down to ultra-low levels, home prices began to levitate. More and more mortgages were being securitized -- purchased by Wall Street, and repackaged into other forms of bond-like paper. The low rates spurred demand for this higher yielding, triple AAA rated, asset-backed paper. In this ultra-low rate environment, where prices were appreciating, and most mortgages were being securitized, all that mattered to the mortgage originator was that a BORROWER NOT DEFAULT FOR 90 DAYS (some contracts were 6 Months). The contracts between the firms that originated mortgages and the Wall Street firms that securitized them had explicit warranties. The mortgage seller guaranteed to the mortgage bundle buyer (underwriter) that payments were current, the mortgage holders were valid, and that the loan would not default for 90 or 180 days. So long as the mortgage did not default in that period of time, it could not be "put back" to the originator. A salesman or mortgage business would only lose their fee if the borrower defaulted within that 3 or 6 month contractually specified period. Indeed, a default gave the buyer the right to return the mortgage and charge back the lender the full purchase price. What do rational, profit-maximizers do? They put people in houses that would not default in 90 days -- and the easiest way to do that were the 2/28 ARM mortgages. Cheap teaser rates for 24 months, then the big reset. Once the reset occurred 24 months later, it was long off the books of the mortgage originators -- by then, it was Wall Street's problem. This was a monumental change in lending standards. It created millions of new potential home buyers. Why? Instead of making sure that borrowers could pay back a loan, and not default over the course of a 30 YEAR FIXED MORTGAGE, originators only had to find people who could afford the teaser rate for a few months. This was a simply unprecedented shift in lending standards. And, it is why 293 mortgage lenders have imploded -- all of these bad loans were put back to them. Note that the fear of this occurring is what was supposed to keep the lenders in line. The repercussions of this is why Greenspan believed the free market could self-regulate. (After all, people are rational, right?) One of the many odd lessons of this era is that, under certain circumstances, companies and salespeople will pursue short term profits to the point where it literally destroys the firm. If you want to point to the single most important element of the Housing boom and bust, this is it. Ultimately, these defaulting mortgages underlie the entire credit freeze. And, it would not have been possible without the Greenspan ultra-low rates, which made the teaser portion (the "2" of the 2/28) of these mortgages so attractive. Contrary to the cliche, failure is not an orphan in the current crisis -- it has 100s of fathers. But these four are the primary movers, the key to everything else. The perfect storm of ultra-low rates, securitization, lax lending standards and triple AAA ratings -- these are the key to how we ended up with the previous boom, followed by a bust, and ultimately, the credit freeze. Is Pimco Doing This For Free? "One of the many concerns expressed on Capitol Hill this week about the Treasury Department’s $700 billion rescue plan was how to keep the Wall Street firms that helped to create the crisis from making a killing if they are hired to help contain it. William H. Gross, the manager of the country’s largest bond mutual fund, has a solution for that: He is offering to do it free. I am curious as to if this is gratis. When Bill Gross offered to do this for free, was he only discussing the TARP, or did it apply to all aspects of the bailout plan? Inquiring minds want to know . . . 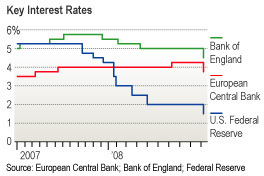 Coordinated rate cuts around the world, 50 basis from the Federal Reserve, European Central Bank and four other central banks. The banks lowered interest rates in an unprecedented, emergency coordinated bid to "ease the economic effects of the financial crisis." The Fed cut its benchmark rate by a half point to 1.5%, as the ECB and central banks of the U.K., Canada, Sweden and Switzerland are also reducing rates. Throughout the current financial crisis, central banks have engaged in continuous close consultation and have cooperated in unprecedented joint actions such as the provision of liquidity to reduce strains in financial markets. Inflationary pressures have started to moderate in a number of countries, partly reflecting a marked decline in energy and other commodity prices. Inflation expectations are diminishing and remain anchored to price stability. The recent intensification of the financial crisis has augmented the downside risks to growth and thus has diminished further the upside risks to price stability. Some easing of global monetary conditions is therefore warranted. Accordingly, the Bank of Canada, the Bank of England, the European Central Bank, the Federal Reserve, Sveriges Riksbank, and the Swiss National Bank are today announcing reductions in policy interest rates. The Bank of Japan expresses its strong support of these policy actions. The Federal Open Market Committee has decided to lower its target for the federal funds rate 50 basis points to 1-1/2 percent. The Committee took this action in light of evidence pointing to a weakening of economic activity and a reduction in inflationary pressures. In a related action, the Board of Governors unanimously approved a 50-basis-point decrease in the discount rate to 1-3/4 percent. In taking this action, the Board approved the request submitted by the Board of Directors of the Federal Reserve Bank of Boston.